Eurol's new website | Eurol B.V.
Eurol has a new website. We have changed the look and feel while also adding a number of new features to eurol.com. You can find the most relevant products within seconds, thanks to smart search functions and the ability to filter products by characteristics such as segment, oil type, and viscosity. We have added a ‘smart search’ button to the oil adviser, allowing you to directly enter a vehicle make and type. Additionally, we have improved the search function and navigation structure. Visitors can enter the fan zone section of the site for inspiration and a taste of what Eurol does by viewing images of the teams sponsored by Eurol. The website now also has deep integration with social media channels. As an example, Instagram activity now appears on the website homepage by default. Eurol products are available worldwide and as such, the current eurol.com website is multilingual just like our previous one. The website is suitable for all screen types, including tablets and mobile phones. Specialty Lubricants, the high-quality line of lubricants, is also prominently named on the website, but retains its own website as a separate brand: www.eurolspecialty.com. ‘We are really pleased with this new design, as it is much more user-friendly compared with the previous website. 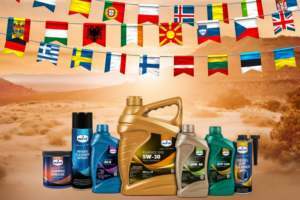 Our product range of lubricants is now displayed more clearly, and the smart search function will help visitors quickly navigate through our large range of products,’ says Dennis Marsman, Marketing Manager at Eurol. The launch of the new website marks the beginning of further developments. Our aim is to continually innovate on the website to optimally serve our clients and visitors.